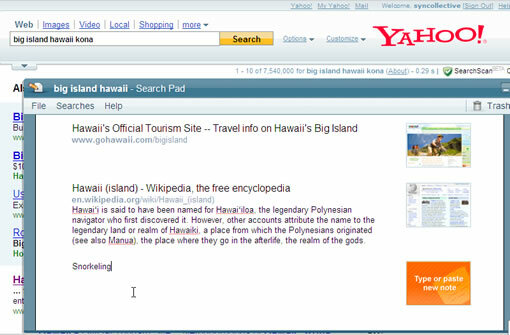 Yahoo is rolling out a new research tool called Search Pad which will make easier for users to take notes while using Yahoo search. The search pad is a king of note taking tool that will allows users to save snippets of the content they are searching. With search pad users can add text from web pages, organize their notes. The search pad will detect intelligently when users are researching for information on Yahoo search, and shows a notification whether they are interested in taking notes of their research. Users can also launch the search pad application by clicking on the icon beside the search box, or turn it off if you no longer wish to use search pad. Search pad is not yet available to all Yahoo users, they will roll out slowly to all users. That’s a great tool for people like me who like to search online but later on do not remember the info. Thanx a lot for sharing. Keep up the good work.